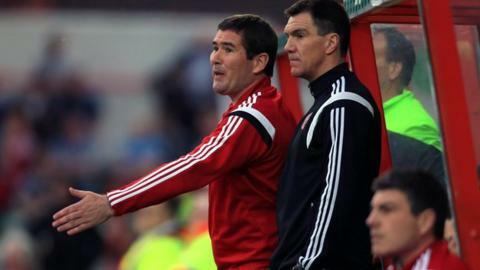 Sheffield United boss Nigel Clough says he does not think his position is under threat after their play-off exit. The Blades lost 7-6 to Swindon on aggregate after a sensational 5-5 draw at the County Ground on Monday. He told BBC Radio Sheffield: "I don't give my future a second thought. If it [being sacked] happens, it happens. "I think we've made progress this season. We've gone from seventh to fifth, we've reached another semi-final and brought through young players." He added: "Ultimately we haven't achieved our aim of getting promotion, if that progress is enough that is for other people to judge. "Our co-chairman Jim Phipps came into the dressing room after the game and said how proud he was and rightly so." Monday's defeat means the Blades face a fifth successive season in League One and have now failed in all eight of their bids to get promoted through the play-offs. Clough felt his side were hampered by the loss of defender John Brayford who was forced off at half-time in the first leg on Thursday with the Blades 1-0 up and is now facing a lengthy lay-off with a knee injury. "He's our best player and our big signing and he's on crutches. Him not being here tonight was a big factor in us not winning," he said. "We're still not sure how long he could be out for. It might be six months or more." After reaching both the FA and League Cup semi-finals since taking over at Bramall Lane in October 2013, next season Clough wants the team to focus on gaining promotion back to the Championship. "We need to look at bringing three or four quality players in," he added. "We need to improve and hopefully that is enough to get us in the top two. All we have in our minds is getting promoted next season and if that is at the expense of the cups then so be it."